Petanque is a game played by many people, especially in France. It is played on a level surface which can be covered with gravel of varying sizes.Boules [metal balls] are thrown along this terrain. The game is played between two teams. Each team has three players [triples] with 2 boules each. At the start of the game, a small ball [coche or jack] is thrown. 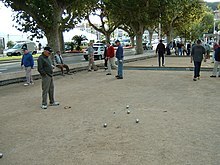 Each player stands in a circle and tries to throw a larger ball [boule] so that it lands close to the coche.The team having their boule or boules closest to the coche at the first end takes the points. Play continues until one team reaches 13. In a doubles game each player has 3 boules. This page was last changed on 19 August 2018, at 17:00.